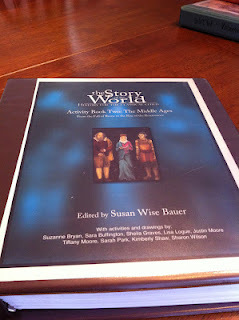 , by Susan Wise Bauer, as our history curriculum. I've had a lot of questions about how we use this in our homeschool. This post will talk you through how we use the curriculum and tell you why we LOVE IT so much! * Is is EASILY ADAPTABLE TO DIFFERENT AGES. As long as your child can listen to a story they can use this curriculum. I modify narration, read-alouds, crafts, and activities to each child's level. * My children get a comprehensive, chronological picture of history. We are working through the 4 year cycle of history and I'm confident I'm covering all the big events in history. * It is scripted and rigorous. The narration questions, mapwork, and supplemental activities are in keeping with the Classical model of education. Purchase the book and activity guide! The activity guide is ESSENTIAL for me. There are so many additional suggestions (books to read, activities, recipes, etc...), and while I know you can find many things online, it's just so helpful for me to have my own history binder. Once I have these books in hand, I head to the office supply store and purchase binders and prepare to make copies. I three hole punch the activity pages and put them in a binder that will be for ME (I can resell this when I'm done). I also makecopies of the activity pages and make each of my children their own binder. When it's time for history during our homeschool day, I just say "Please go get the history binders" and we are ready to go. , and I've caught them reading their Ancients binder from last year several times this year. 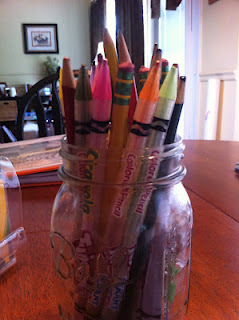 Be sure to have colored pencils/crayons, glue sticks, and scissors on hand. We have them all in one container so it is easy to transport outside! A three hole punch and scrapbooking papers come in handy, too. I love that the activity guide gives suggestions for read-alouds and additional activities. I sit down once every few weeks and reserve books from the library that go with the chapters we are studying. I keep the books in our library basket and encourage the children to read them. I also choose a large read-aloud every few chapters. We have read so many great books this way. In fact, I choose most of our read-alouds from the SOTW Activity Guide. I also look for notebooking pages and lapbook elements to add to our history notebooks. Don't feel limited to just the activity pages. Adding dimension and personality to the notebooks makes them more meaningful.
. I catalog my favorite resources there in detail. for Volume 1. What a treat they are!) There are some chapters in which I will require my children to write their narrations. Sometimes, however, a verbal review is enough for me. They are coloring, taking notes, or building LEGO creations to match the chapter while I am reading. 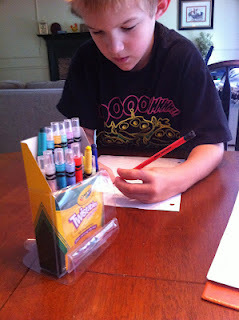 I love the coloring sheets, paper dolls, masks, and other engaging activity sheets. 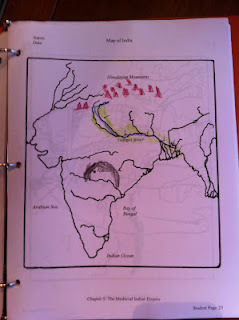 The maps are thorough and the activities for mapping are so meaningful. We recently completed a color coded map activity to show the spread of the plague in the Middle Ages. It was amazing how this activity brought the chapter to life. I also keep a globe on hand to reference during our map work. )... I find my children looking through this book and reminiscing about chapters we have read. That does my heart good. What can you do to extend the learning for your child? Are they particularly interested in one certain chapter? Stop and spend some time there. I can't tell you how long we spent in Egypt - we took a field trip to a museum which had lots of mummies. We made an Egyptian feast and still continue to check out books about mummies from the library. In this way, using this curriculum fits in perfectly with much of our Interest Led Learning lifestyle. to show you our notebooks and share some more information with you. If you have any questions, please ask!! I love this curriculum and wholeheartedly recommend it to everyone who will listen. Below are the links for the books we are currently using. A good history encyclopedia and atlas are a good investment, no matter what history curriculum you use!